Students, teachers and parents across the UK are eagerly checking A-level results today. These scores will largely determine the students’ future. How have students fared across the UK? Tens of thousands of students in England, Wales and Northern Ireland have received their A-level results today, with initial UCAS figures showing that fewer students have been accepted onto UK degree courses this year. Entries in facilitating subjects are up. The proportion of A-level entries receiving an A* has fallen to its lowest level in five years. An A* was awarded to 8 per cent of entries in the UK – down from 8.3 per cent last year, and the lowest proportion since 2013.The share of entries receiving A*-E grades has also fallen to its lowest since 2010, dropping 0.3 percentage points from 97.9 per cent in 2017 to 97.6 per cent this year. Recent reforms to A-levels in England may have led to the drop in results. These UK government education reforms include less coursework and exams sat after two years.Education Damian Hirst defended the A-level reforms, stating, "There’s a lot more to education, a lot more to achievement than exams alone. Exams do play an important role of course in recording students achievements, their abilities and help them to move on to the next stage." 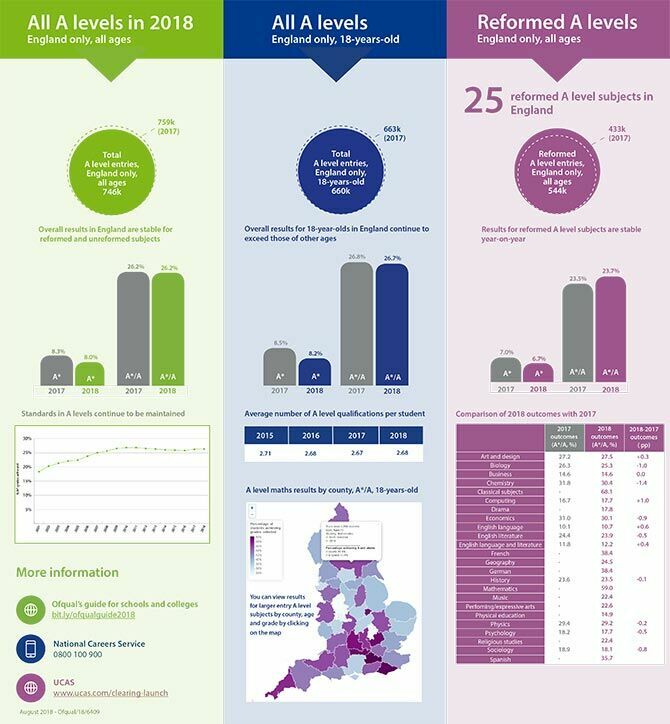 New analysis from Ofqual shows that boundaries in reformed A-levels have fallen slightly on last year.The exam regulator said it was "particularly difficult to compare reformed grade boundaries with the legacy qualification" because of the reduction of coursework, so it only looked at boundaries in reformed A-levels which were first awarded last summer "to compare like-with-like". Girls have narrowed the gender gap when it comes to gaining A*s. 8.5 per cent of male entries and 7.6 per cent of female entries received an A* grade this year. This is up from last year when it was 8.8 per cent of boys and 7.8 per cent of girls. STEM subjects (Science Technology Engineering and Maths) continued to rise in popularity. In 2018, 36.2% of all entries were in one of these subjects, an increase from 28.0% in 2009, 33.4% in 2014, and 34.5% in 2017.Male students are more likely to study a STEM subject, with them making up 57.0% of all STEM entries. The balance, however, is starting to shift. More female students take Biology and Chemistry than male, with more male students taking Mathematics and Physics. But year on year comparisons show that females are closing the gap in these subjects, with entries rising 3.1% for Mathematics (compared to males rising 2.1%) and 6.9% in Physics (males rising 2.4%). However, there is still a long way to go to close the gap completely. What should students do if exam results are disappointing? Debbie Bowker, Director of Bowker Consulting Ltd, an education consultant for relocating families, spoke to Relocate Global about what students should do if their exam results were a disappointment. She said, "Pursue retakes and remarks. If it means that much it will be worth the wait. effort and cost. This may result in you attending a tutor college or approaching your school to enter Yr 14 on a part time basis. "Or, turn it on its head and see it as a positive. Look into alternative courses i.e. instead of medicine do biomedical science. There will be a heap of unfilled courses available, maybe ones you had not considered but on reflection suit you better." Overall results in England are stable for reformed and unreformed A levels and standards have been maintained. It is important not to over-interpret relatively small changes in year-on-year results. Entries for reformed AS qualifications in England have dropped which makes it much more difficult to compare year-on-year results. The variability in results within centres is similar to previous years showing that schools and colleges have responded well to the reforms. Even when there are no changes to qualifications, individual schools and colleges will see variation in their year-on-year results; this is normal. A British Academy analysis on the impact of A-level choices shows a decline in A-level studies in modern languages, English, history and geography, with similar trends seen in undergraduate and postgraduate numbers, which could easily put the UK at a major disadvantage in a post-Brexit world.Historian Professor Sir David Cannadine, president of the British Academy, said: “We are concerned that the decline in students studying humanities subjects at A level is already having an impact on the skills of the future workforce, especially when it comes to foreign languages. How important are languages for global citizens of the future? Heidi Mason one of Bowker Consulting's education consultants and an ex-Head of languages, gave her views on the reduced number of students taking A-levels in languages. Mason said, "Traditionally when students studied 4 A levels it was often advised they take a language as the fourth. Since the reduction in amount of subjects studied (as a result of the AS going) language A-levels have been hit severely. Russell Group universities have always looked favourably on students with at least a GCSE in a language. It is interesting to note that many state schools have languages as an optional subject at GCSE whilst grammar and independents retain an MFL subject as a compulsory strand. "We are very rapidly becoming a one dimensional, monolingual nation, unable to converse in any other language apart from English. This in turn restricts cultural awareness, results in the inability to pick up on nuances associated with the other peoples’ mannerisms, expressions, idioms and the general way they come across and express themselves. It hinders potential relationships whether personal or business. Even knowing one more language equips you to understand and acknowledge foreign differences and be more understanding and accepting of other people, surely a must in today’s global society." Paul Whiteman, general secretary of school leaders’ union NAHT, echoed these post-Brexit concerns, saying: “The future productivity and success of the UK in a post-Brexit world depends on the success of the young people who are getting their qualifications this month. But it doesn’t depend on the grades they get, it depends on the kind of people they are. "They will be the ones who take and create the jobs of the future which require a breadth of skills and not necessarily a narrow band of academic study. For this reason, the narrowing of options at A level is a real cause for concern." In anticipation of this year's A-level results, the Confederation of British Industry (CBI)'s Head of Education & Skills policy, John Cope, said: “University absolutely offers students a great next step but is by no means the only route to a higher-level education. There are a range of different options - a Higher National Certificate or Diploma, a foundation degree, or a ‘degree apprenticeship’, with an apprenticeship offering the chance to gain both a qualification employers value and start earning a salary straight away.”City & Guilds has commented about the A-level results, highlighting the range of alternatives to the traditional academic paths available to 14-19 year olds especially in light of the UK's looming skills gap. City & Guilds believe that the country’s young people should be made aware of the alternative routes into the workplace.Commenting on the 2018 A-level and GCSE results, Kirstie Donnelly, Managing Director of City & Guilds and ILM, said: “Now more than ever, young people have access to an array of different routes into education and employment. While A-Levels or GCSEs may be exactly the right approach for many, these should not be seen as the only way to gain employment or a successful career. If we deter young people from alternatives to academia, it’s not just them that will suffer, but UK businesses too.”Although the academic route, from GCSEs and A-Levels into university, is right for many, different options are available. These include apprenticeships and TechBac – the City & Guilds curriculum for 14-to-19 year olds, which combines industry specific and general workplace skills development with on-the-job experience. Some schools overseas use Cambridge IGCSE and Cambridge AS & A Level and those results were released on 14 August 2018.Cambridge Assessment International Education is part of the University of Cambridge. The Cambridge Pathway gives students a clear direction for education success from the age of 5 to 19. Over 10,000 schools in over 160 countries around the world offer Cambridge qualifications. The first Cambridge international exams were taken in Trinidad in 1864 by six candidates. Cambridge Primary is taught in more than 1300 schools in over 110 countries. 2013 marked the 25th anniversary of the first Cambridge IGCSE exam which is the world’s most popular international qualification for 14 to 16 year olds. It is taken in over 145 countries and in more than 4800 schools around the world. Cambridge IGCSE exams each year. Cambridge International AS & A Levels are taken in over 130 countries with more than 525,000 subject entries each year. A spokesperson for Cambridge International Examinations said, “Internationally we have continued to see more schools than ever before choosing to offer Cambridge International qualifications. Exam entries in June 2018 grew by eight per cent internationally on June 2017, with seven per cent growth in entries for both Cambridge IGCSE and Cambridge International AS & A Level. “Our qualifications are widely recognised by universities and employers around the world and thousands of students use Cambridge qualifications every year to gain places at leading universities. Over 1400 universities recognise our qualifications, including over 500 universities in the US (including all the Ivy League) and all UK universities. University admissions officers tell us that Cambridge International AS & A level syllabuses prepare students well for university study, which is why they value and recognise Cambridge International AS & A Level qualifications.”Visit the Cambridge International website if you are interested in learning more about the Cambridge IGCSE and Cambridge AS & A Levels. At A Level, BSB results were even better than last year’s excellent results, as BSB continues to adapt to the new, more challenging linear A Level system. BSB students achieved an impressive 100 per cent pass rate, with an 35 per cent of grades at A*/A (which is well above the 26.2 per cent national average 2018) and a 13 per cent at A* (again, well above the 2018 national average which is 8 per cent). 97.9 per cent of students at the British School in the Netherlands achieved a pass (A*-E grade) and one in three grades earned by students were A* or A grades. Over 60 per cent of all grades received were either A*, A or B grade compared to the 2018 UK average of 53 per cent and the average point score for the cohort was 122, equivalent to BBB. BSB students achieved a 100 per cent pass rate, with an impressive 35 per cent of grades at A*/A (26.2 national average 2018) and a remarkable 13 per cent at A* (2018 national average 8 per cent). 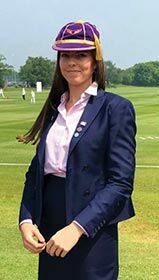 d’Overbroeck’s Principal, Emma Kate Henry, said, "We would like to thank all our students and staff for their hard work over the last two years. 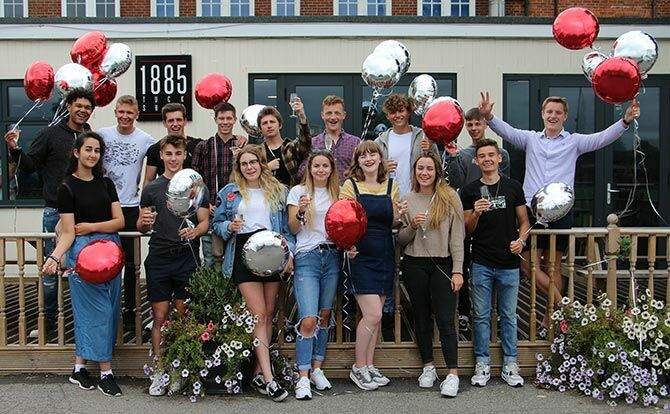 Their results show how well they worked with over one in five exam entries gaining a grade A* and more than one third of our students gaining 3 or more grade A or A*s at A level (including EPQ). "We are also delighted with our student’s results in their Extended Project where nearly half of students gained an A* demonstrating outstanding research and communication skills. Best wishes to all our students in their future studies and careers." A level results at Dulwich International High Schools in Zhuhai and Suzhou showed that 48 per cent of grades received were A* or A and over 70 per cent were A*-B.
Haileybury School is celebrating a strong set of A level results. Over a fifth of Haileybury A level pupils scored straight A* or A grades; the number of A* grades awarded at A level - 37 in total - is amongst the highest in the School’s history.This year’s Upper Sixth Form performed well as a year group with 45% of all grades being awarded at A*/A or the equivalent and 73 per cent of grades awarded at A*-B or the equivalent.A large majority of Haileybury pupils have secured places at a university of their choice, with pupils confirmed to study at Oxford, Imperial, Durham, UCL, King’s and Warwick to name a few of the top university destinations in the UK.The Master, Martin Collier, commented: "We are very pleased that the Upper Sixth Form pupils have performed so well. Their strong grades are the result of much hard work on their behalf and we are very proud of them. It is also worth pointing out that such strong grades are the result of the dedication of the staff; our pupils were very well supported over the course of the last two years by a very able and committed teaching staff." Kent College Canterbury students and staff are celebrating another successful year for A level results, with over 67 per cent passed at grades A*-B, and almost half of all grades at A*-A.
Kent College Dubai's Vice Principal Academic said, "Our first A level cohort have achieved excellent results this year with a 100 per cent pass rate and 71 per cent A*/B. Nearly all pupils have gained admission at their first choice University. The most outstanding results were in the Sciences and Maths." These results further reinforce Lancing’s strong reputation for consistently high academic achievement, year-on-year at A Level and with exceptional performances this year in Maths, History, Biology, Chemistry, Music and Politics.Commenting on the results Dominic Oliver, Head Master said, “I am delighted at the results this year. Our pupils have continued to respond well to the changing demands of the A Level system introduced two years ago. We have again seen exceptional results from pupils who have been at Lancing since the age of 13 as well as those who joined us just for the Sixth Form." Merchiston Castle School's A-level students woke up to an excellent set of A Level results this morning. Merchiston is delighted that, in almost all cases, the boys surpassed their own personal targets and exceeded the ALIS predictions made by Durham University. A formidable 50% of grades are at A* or A at A Level or Advanced Higher, almost double the national average. And, a full 20 per cent of this total is at A* level.Stephen Campbell, Deputy Head Academic, comments: “we are absolutely delighted that our pupils’ average UCAS points yield is 141. This is an astonishing achievement when one considers that three A grades at A Level are worth 144 UCAS points.”These results build on an excellent set of SQA (Scottish Qualifications Certificate) results earlier in the month, including the achievement of 'straight As' across all presentations at Advanced Higher. Padworth College is celebrating A-level results this summer. Particularly encouraging is that nearly half of all entries were awarded A*–B grades and there was an increase from last year in the number of grades A*–C to 66per cent. The overall pass rate has also improved to 91per cent.The retiring Principal, John Aguilar, commented, "I am delighted for our students. Everyone deserves to be congratulated on their efforts and I thank staff for all their hard work and help in supporting students throughout their time at the College." The Tanglin Trust School achieved a 100 per cent pass rate. 45 per cent of all grades achieved were an A* or A, and 13 per cent of all grades were an A*. 93 per cent of all grades were in the A* to C range. 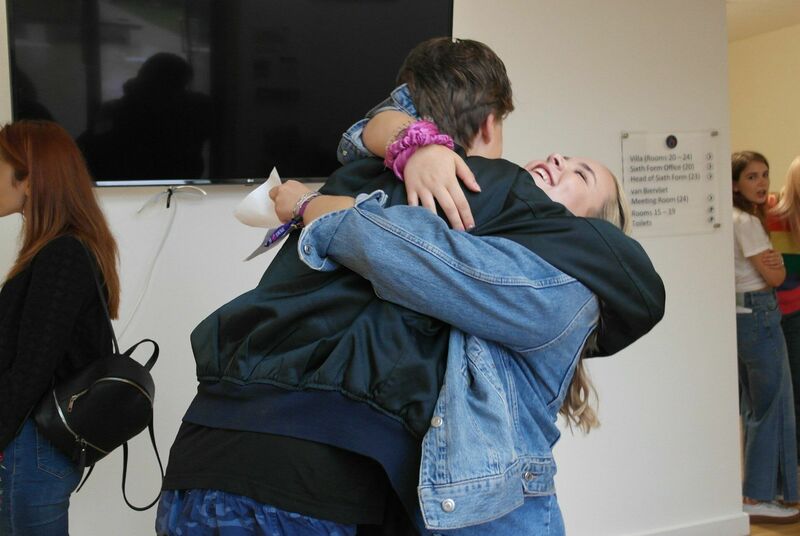 The Alice Smith School is celebrating record-breaking A Level results this year. 56 per cent of grades awarded were A*/A and 40 per cent of students achieved straight A*/A grades. 92 per cent of all grades were awarded at A*–C. For the latest education news, articles and practical advice, see our Education & Schools section. The Relocate Guide to Education & Schools in the UK is a helpful tool for any family trying to negotiate the UK school system. It covers State, independent and international schools and helps you explore your options or to aid an employee who is trying to determine theirs. You can access it here.